More pickup trucks are sold in Texas than in any other state. To be a real Texan, you need the perfect Texas truck. Why do Texans love their trucks so much? For ranchers, they’re practical; for most everyone else, they’re just fun to drive. Here’s a look at just how crazy lifted trucks in Texas can get. The Texas Truck truth: they’re really big. The best-selling truck in Texas is the Ford F-150. Now, the F-150 may be called a “light-duty pickup,” but it’s a pretty substantial machine, with a 12,200-pound towing capacity. The F-150 shrinks next to the official 2017 Truck of Texas: the F-Series Super Duty. If you want to see a real Texas truck, climb into the cab of the F-450 Super Duty. The F-450 can tow up to 24,700 pounds and carry nearly 6,000 pounds. The top-of-the-line Platinum edition (starting around $77,000) is a chrome-grilled super beast that’s heavier than three Honda Fits. Seriously — Texas trucks are so big they don’t even sell them in stores. 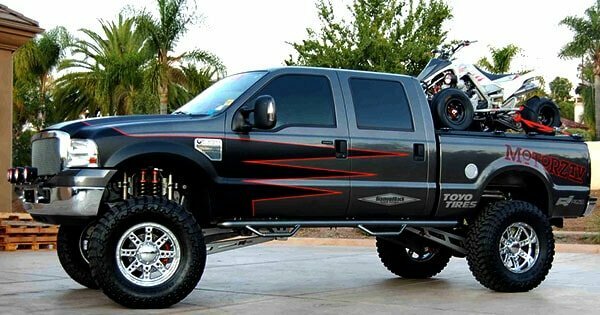 A true Texas truck lover might look at the F-450 and say, “Well, that’s cute. But it’s a mite small.” That’s when you call Truck Customs and ask them to make you a SuperTruck. What’s a SuperTruck? It’s a pickup truck made from a Ford F-650 commercial truck body. It’s big. It’s bad. And it’ll cost you close to $100,000 — more if you add custom paint, chrome fuel tanks, dual stacks and a train horn. If even the F-650 isn’t enough truck for you, Truck Customs also turns International DuraStar hauler bodies into pickup trucks with a 330-hp diesel engine. Want more truck than that? Well, we honestly don’t know what to tell you. Texas trucks are lifted, supercharged and customized. If no one’s looking twice at your truck, it’s time to take it to Extreme Offroad and Performance in Katy, Texas. This shop customizes pickups with rims, shocks, superchargers, brush guards, headache racks, window tinting and graphics. Add a big star to the grille, and you’re ready to roll. See some of their work — including airbrushed flames and skulls — in this video. Texas trucks don’t care about being eco-friendly. The F-450 gets about 11 miles per gallon, according to Fuelly. The 2017 F-150’s a little better, getting an EPA-estimated 16-20 mpg, depending on the model. Other not-so-efficient trucks: the Chevrolet Silverado (19 mpg), the GMC Sierra (17-19 mpg), and the Ram 1500 (15-19 mpg). Some Texas truck owners love to give a big middle finger to green-minded people by “rolling coal.” This means modding your diesel truck to remove emissions controls and spew black smoke. Federal laws say rolling coal is illegal, but Texas laws don’t specifically prohibit it. Even car insurance rates are bigger in Texas. Texas has the nation’s 13th highest insurance, according to the Insurance Information Institute, with an average annual expenditure of $895.44. Of course, the amount an actual driver pays will vary depending on his or her driving record, the vehicle driven, and other factors. To get a sense of how much you might pay, check out our Texas car insurance comparison. In Texas, drivers are required to carry at least $30,000 in bodily injury coverage per person, $60,000 in bodily injury coverage per accident, and $25,000 of property damage coverage. Texas uses a system of electronic verification called TexasSure to check that drivers are carrying insurance. Are you paying too much for Texas car insurance on your truck? Compare quotes from multiple insurers on Compare.com and get a better deal.